Air Canada is following in the footsteps of Porter Airlines by offering December-March service to Mont-Tremblant. But unlike Porter, which also offers summer service and flies out of Toronto Island Billy Bishop Airport, Air Canada is offering the service from its main hub at Lester B. Pearson. It’s practically half the population of Ontario. They like to ski and the great outdoors Air Canada is following in the footsteps of Porter Airlines by offering December-March service to Mont-Tremblant. Air Canada will initially offer four flights a week (Thursday, Friday, Sunday and Monday), from December 18 until March 30, to capitalize on growing demand for Mont-Tremblant and tailored for short stay ski break holidays, said Arthur. The service is provided by Air Canada Express using a 74-seat Bombardier Q400 aircraft, the same one used by Porter which offers up to 13 flights a week during peak season. Mont-Tremblant International Airport is a single runway airport located in the township of La Macaza, about 35 kilometres north of Mont-Tremblant, which offers a shuttle service to various hotels at the foot of the mountain. The airport was originally built in 1962 for the RCAF by Boeing to military specifications, as an RCAF emergency landing field, with a runway of 6,000 feet. It subsequently became home to 447 SAM Squadron, armed with 29 nuclear-tipped CIM-10 Bomarc missiles. After 1968 the station became CFB La Macaza and closed as an active base in 1972 following the removal of the Bomarc missiles. Later converted to a civilian airport, it was turned into an international airport in 2000 despite a referendum held in the region stating that the citizens of La Macaza opposed the project. The airport consists of a small chalet style terminal building along the east side of the runway, but there are no hangars for aircraft storage. The airport operator is planning to expand the airport by extending the runway to 8,202 ft. to accommodate larger jets, building a larger terminal and adding a water aerodrome for floatplanes on the south end of the runway at Lake Chaud. 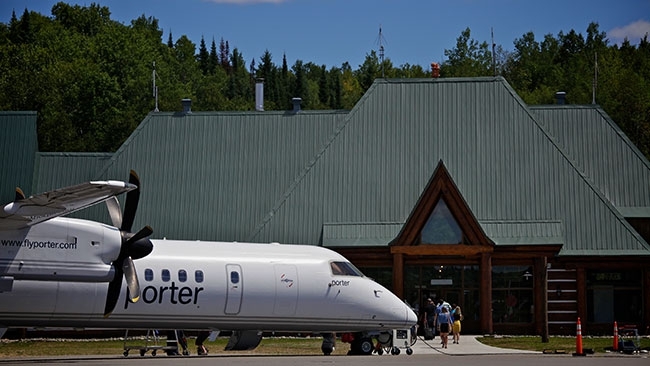 Porter and now Air Canada Express are the only airlines offering scheduled service to Mont-Tremblant, although Thunder Bay’s Voyageur Airways offers a charter service. Porter also offers service from Newark, New Jersey, via Billy Bishop, replacing Continental Airlines which stopped offering non-stop flights two years ago. Porter also offers seasonal service to Burlington, Vt. Asked what impact Air Canada’s new service might have on them, Porter was confident it would be minimal. “We have a strong base of customers for Tremblant and a better schedule, so we expect to maintain the business that we have had historically,” said Porter spokesperson Brad Cicero. Trudel figured that a lot of people who weren’t wiling to make the trip downtown to fly out of Billy Bishop may now be interested to fly out of Pearson. But Tremblant is also attractive to Americans, he added. But Americans are starting to return, despite stiff competition from ski areas in the Eastern United States closer to home, said Trudel.